Hi Lois. I was in the process of modifying the post above when you chimed in. The coordinates are very close but that is most likely the Apollo 15 Command Service Module (CSM) . I coincidentally was looking at this article the night before Auntym posted it. I need to go back and double check to make sure but I found the image (AS15-87-11695) in the Apollo 15 archives. That one was tough ! It took a lot of searching to come to that conclusion with some confusion that it is the Command Service Module of the Apollo 15 mission,,,,,Wow ! At 1st I thought it was the Command Service Module. I then deleted that post because it appears the object is on the surface casting a shadow on the Moon but it isn't. Even the guy who posted the article thought it was on the surface. If it was on the surface it couldn't be a Command Service Module because those stay in orbit with one Astronaut aboard while the other Astronauts land on the surface in the Lunar Module. This is where It became confusing. I thought because of the coordinates that maybe it was Apollo 17 but then realized that it was Apollo 15 after extensive research through archives of data. I came to terms that it isn't on the surface that the shadows only appear that way and since it is in orbit that it is in fact a Command Service Module as I had originally thought and it's from the Apollo 15 Mission. Cliff, (& AuntyM) you nailed it! Heh heh, all it requires is a brain (but apparently the 'alien-base' crowd don't use them)....and to recognize the high-gain antenna array on the Command Module. They are very distinct (2x Micky Mouse ears) and are clearly visible in the 'alien-base' photo, heh heh. Not to mention that the moon is fuzzy while the 'alien-base' is sharp and in focus. Cliff, I presume that the photo was taken from inside by the LEM? 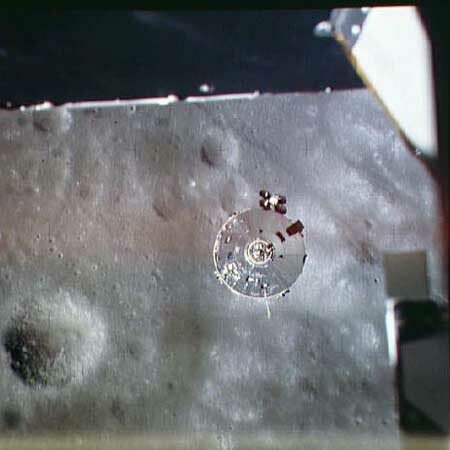 Do you know if the LEM began descent by lifting OFF the Command Module or is this photo taken during ascent to re-dock? I'm curious why the Command Module is below the LEM. One can clearly see the docking ring on the egress port on the Command Module. The photo was taken from the Lunar Module (LM). I wonder too why the Command Service Module is below it. Several things threw me off in this . I noticed there was another person on another forum working and posting on this case about the same time I was and I mentioned the coincidence. We both came to the conclusion that it was the Command Service Module. I had started researching this coincidentally about 24 hrs. before Auntym posted the article. It took a lot of searching through data to figure out that it was the Apollo 15 mission. Because of the similarities and proximity in the given coordinates I thought it was the Apollo 17 at first. Their landing sites were both in the same general area or close to the crater , 'Mare Serenitatis', (The Sea of Serenity). Apollo 15 Command and Service Module in lunar orbit photographed from the LM while over the Sea of Serenity, north of Bessell Crater on Rev 12, two orbits prior to PDI. There are a few areas on the Moon that I have looked over after others brought it to my attention that seem suspect to being something other than a crater. I have found a few in question on my own also. 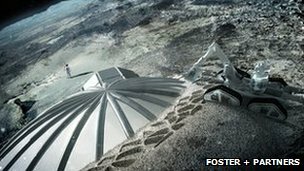 Architects Fosters and Partners have revealed designs for a building on the Moon that could be constructed from material already on its surface. An inflatable structure would be transported from Earth, then covered with a shell built by 3D printers. The printers, operated by robots, would use soil from the Moon, known as regolith, to build the layered cover. The proposed site for the building is the southern pole of the Moon. It is designed to house four people and could be extended, the firm said. In 2010 a team of researchers from Washington State University found that artificial regolith containing silicon, aluminium, calcium, iron and magnesium oxide could be used by 3D printers to create solid objects. The latest plans are the result of a collaboration between a number of organisations including the European Space Agency. The consortium tested the practicalities of using a printer on the Moon by setting up a D-shape 3D printer, which are used to print very large house-sized structures, in a vacuum chamber with simulated lunar material. "As a practice, we are used to designing for extreme climates on Earth and exploiting the environmental benefits of using local, sustainable materials," said Xavier De Kestelier, a partner in the firm's specialist modelling group. "It has been a fascinating and unique design process, which has been driven by the possibilities inherent in the material." Buildings on this planet by the architect firm include Wembley Stadium, the World Trade Center in New York and Beijing airport. Last week US company Deep Space Industries (DSI) announced plans to use asteroid material for manufacture by harvesting them and using 3D printers sent into space. The company is also developing a bespoke 3D printer called MicroGravity Foundry for the purpose, it said, and hopes to be ready to start production by 2020. Please don't mind me posting this video in its own thread. This particular UFO footage being never before seen on the net as well as the activity displayed by the UFO while exhibiting certain characteristics should all combine to make this one worth your while. Source identifier: Apollo 11 16mm DAC Magazine H, starting at 5min:47s mark. Onboard: Lunar Module Ascent Stage. Airborne and traveling West after completion of surface operations. Footage Captured by: Edwin Eugene "Buzz" Aldrin, Jr. Apollo 11 LM Pilot. UFO Type: Rapidly pulsating luminescent object. A luminescent UFO materializes around middle of crater named D Arrest B. Initially it moves to northern edge of the crater in a single pulse. At this point, the UFO executes a turn towards a large crater wall in Northwest direction, taking off with sudden and rapid acceleration. The UFO seems to be utilizing the up-slope climb along the crater wall in combination with rapid acceleration to 'launch' itself airborne. More detailed analysis will follow soon at the blog. Materialization, display of active and deliberate control including change in direction of travel, rate of acceleration and last but not least, ability to launch/lift-off from lunar surface. Speaking of the obvious here but don't forget a meteor or random debris floating around lunar surface can't just take off into the air like this because of something called gravity. These are few of the things that make this footage a one of the most coherent evidence for existence extraterrestrial intelligence controlled craft on the Moon. Please note: This footage is 100% authentic and verifiable. Refer to source identifier. I'm amazed every time we "catch" such quick movement. Makes one think about what we "imagine" we see out of the corners of one's eyes. Earth's axis is titled about 23.4 degrees from vertical, meaning sunlight reaches every surface, even the north and south poles, for at least part of the year. The moon www.space.com/55-earths-moon-formation-composition-and-orbit.html, meanwhile, is tilted just 1.6 degrees, nearly perpendicular to the direction of the sun's light. This means that there are some deep craters near the moon's poles that haven't seen the sun for over two billion years. For the past 8 years, NASA astronomers have been monitoring the Moon for signs of explosions caused by meteoroids hitting the lunar surface. Lunar meteor showers" have turned out to be more common than anyone expected, with hundreds of detectable impacts occurring every year. They've just seen the biggest explosion in the history of the program. Unlike Earth, which has an atmosphere to protect it, the Moon is airless and exposed. Lunar meteors crash into the ground with fair frequency. Since the monitoring program began in 2005, NASA’s lunar impact team has detected more than 300 strikes, most orders of magnitude fainter than the March 17th event. Statistically speaking, more than half of all lunar meteors come from known meteoroid streams such as the Perseids and Leonids. The rest are sporadic meteors--random bits of comet and asteroid debris of unknown parentage. "On March 17, 2013, an object about the size of a small boulder hit the lunar surface in Mare Imbrium," says Bill Cooke of NASA's Meteoroid Environment Office. "It exploded in a flash nearly 10 times as bright as anything we've ever seen before." NASA's lunar monitoring program has detected hundreds of meteoroid impacts. The brightest, detected on March 17 in Mare Imbrium, is marked by the red square. Anyone looking at the Moon at the moment of impact could have seen the explosion--no telescope required. For about one second, the impact site was glowing like a 4th magnitude star. Ron Suggs, an analyst at the Marshall Space Flight Center, was the first to notice the impact in a digital video recorded by one of the monitoring program's 14-inch telescopes. "It jumped right out at me, it was so bright," he recalls. The 40 kg meteoroid measuring 0.3 to 0.4 meters wide hit the Moon traveling 56,000 mph. The resulting explosion1 packed as much punch as 5 tons of TNT. AArghh ! I wanted to observe last night but it was cloudy. It would be cool if they would show a video of the event. I'll do some digging and see if anyone caught it. The other day on an astronomy forum a member was talking about seeing something similar to this and described a cloud like appearance after what he thought may have been an impact. It is possible. It says the guy from NASA caught it on video with a 14 inch scope,,,I wonder if they will release it. March 17th was the date. I'll be looking next year at that time right along with them and giving a heads up to the amateur community to be on the watch. I'm posting it on my calendar now. Vials of moon dust brought back to Earth by the first men on the moon have been found inside a lab warehouse in California after sitting in storage unnoticed for more than 40 years. The samples ï¿½ collected by Apollo 11 astronauts Neil Armstrong and Buzz Aldrin ï¿½ were rediscovered last month by an archivist who was going over artifacts tucked away at the Lawrence Berkeley National Laboratory. "We don't know how or when they ended up in storage," Karen Nelson, who made the surprising discovery, said in a statement from the lab. Nelson came across about 20 vials with handwritten labels dated "24 July 1970," packed in a vacuum-sealed glass jar. Accompanying the jar was an academic paper published in the Proceedings of the Second Lunar Science Conference in 1971, titled "Study of carbon compounds in Apollo 11 and Apollo 12 returned lunar samples." All of the authors of the paper were from the University of California, Berkeley's Space Sciences Laboratory, including Nobel Prize-winning chemist Melvin Calvin, who worked with NASA on efforts to protect the moon from contamination during the first lunar landing, as well as plans to protect Earthlings from unknown pathogens feared to be lurking in lunar dust. The moon dust samples were supposed to be sent back to NASA after the Space Sciences Laboratory team finished their experiments. By some wrong turn, they ended up in storage. The lunar crash site from an meteorite strike on the moon is taking center stage in cosmic crime scene investigation and you can see the space rock impact zone online in a free webcast tonight tonight (May 22). The asteroid strike on the moon occurred on March 17 and marked the brightest lunar impact explosion seen since 2005, NASA scientists have said. The space agency announced the discovery of the impact last week. Tonight, the online Slooh Space Camera will broadcast live views of the meteorite's impact site and you can watch the moon webcast on SPACE.com starting tonight (May 22) at 9 p.m. EDT (0100 GMT). NASA scientists estimate that a 1-foot-wide (0.3 meters) meteoroid slammed into the moon at 56,000 mph (90,000 k/h) to carve a 65-foot (20 m) crater into the lunar surface. The resulting explosion would have been visible from Earth without a telescope and had the power of about 5 tons of TNT, NASA officials said. This suggests that a fairly dense swarm of meteoroids zipped through our orbit at that time, two months ago." Cliff .. Tell me what you think. If Nasa took this photo what could it be? Read the funny comments on this link. I'll take a look Lois. I believe it can be found in the Apollo 17 archives. I'll write down the # for now so I can use it as a reference to find the original image. It will take some searching through the archives as the #'s don't seem to match the one mentioned in the video (unless I'm making a mistake). The 50 United States each received Apollo 11 moon rock displays after the first lunar landing, but 44 years later 11 are missing. Eleven states' Apollo 11 moon rocks are missing. Despite a search that has lasted more than a decade, the current whereabouts of the Apollo 11 moon rocks gifted to Alabama, Louisiana, Nevada, New York, South Carolina, Texas, Utah, Virginia, Washington and Wisconsin are still unknown. The eleventh missing display, presented to Delaware, was stolen in 1976. Forty-four years ago Wednesday (July 24), astronauts Neil Armstrong, Buzz Aldrin and Mike Collins returned to Earth after completing the first mission to land on the moon. The souvenirs of the moonwalkers' success were 48.5 pounds (22 kg) of lunar material, including samples of the moon's fine-grain soil and 50 rocks. As the first-ever geologic return from another world, every pebble was scientifically precious, even the scraps found at the bottom of the astronauts' collection bags. So it was a particularly prestigious honor when four months after the Apollo 11 mission, then-President Richard Nixon decided to award tiny specimens — 0.05 grams (0.002 ounces) each in the form of four specks — to each of the 50 U.S. states, as well as the nation's territories and 135 foreign nations. Each of the displays' four small stones were embedded in a single acrylic button and mounted to a desktop wooden podium. Accompanying the moon rocks was a small state or country flag, which had been flown to the moon by the Apollo 11 astronauts. This month's full moon, which rises on Tuesday (Aug. 20), is not just a Blue Moon — it's also the Full Sturgeon Moon, the Full Red Moon, the Green Corn Moon and the Grain Moon. Tomorrow's full moon qualifies as a Blue Moon because it's the third full moon in a season with four (most seasons have only three). Historically, there have been two different definitions of a Blue Moon. The moon's extra names come from traditional monikers for the full moon of a given month. A few hundred years ago, Native American tribes in what's now the northeastern United States kept track of seasons by ascribing particular names to each full moon. Later, European settlers added their own names for the full moons to the lexicon. When the full moon rises tonight (Aug. 20), it will technically be a Blue Moon, but not for the reason you might think. The Blue Moon tonight is not the second full moon of August, but actually gets its name from a relatively obscure rule of astronomy. And there are a few other details about the full moon that might surprise you. 2) There are two definitions for Blue Moon: The term Blue Moon was originally assigned to the third full moon in a four moon season, but after a mix up in "Sky & Telescope" magazine in 1943, the term took on a different meaning. An article in the magazine incorrectly defined a blue moon as the second full moon in a single month, but the definition stuck. This particular blue moon is a technical Blue Moon, but does not meet the criteria for the second definition. The third full moon in a four-full-moon season rule was detailed in a 1937 edition of the now defunct Maine Farmers' Almanac. 3) The Blue Moon has many names: Today's full moon is also known as the Full Sturgeon Moon, the Green Corn Moon, the Grain Moon and the Full Red Moon. Each of August full moon names come from monikers given to the full moons of a certain month according to Native American and European traditions. 4) It's only full for a moment: Although the moon usually looks full one day before and one day after the day of the full moon, there is technically only one moment when the moon is full in the sky. Tonight, the moon turns full at 9:45 p.m. EDT (0145 Aug. 21 GMT), when (weather and light permitting) the moon will be in view for people along the eastern coast of the United States. 5) It's kind of a rare sight: Blue Moons occur somewhat infrequently. After today's full moon, another Blue Moon will not occur again until 2015. The idiom "once in a Blue Moon" signifies a rare event because scientists had trouble predicting when the distinctive full moon would happen during any given year. Editor's note: If you have an amazing photo of the August full moon, or any other night sky sight, and you'd like to share it for a possible story or image gallery, please contact managing editor Tariq Malik at spacephotos@space.com. Nothing prepared me for the starkness of the terrain. It was barren and rolling, and the horizon was much closer than I was used to.It was a most profound sight and experience! Earth’s diameter is such that its inhabitants have no personal awareness of the curvature; it’s easy to understand why, for centuries, it was believed to be flat…but on the smaller Moon, my impression was that we were on a ball; or on the knoll of a hill that extended more than one mile, and was neatly rounded off. I even felt a bit disoriented because of the nearness of the horizon. In every direction, the surface was pocked with thousands of little craters and many larger ones, two to sixteen yards across, and littered with angular rocks. It looked like a collection of just about every variety of shape, angularity and granularity of rock. At first, I couldn’t see much color. I was particularly struck by the contrast between the starkness of the shadows and the desert-like barrenness of the rest of the surface. It ranged from dusty grey to light tan, and it was unchanging except for one startling sight. Our lunar module, with its black, silver and bright orange-yellow thermal coating shining brightly in the otherwise colorless landscape. The color of the ground depended on the angle of the Sun. It could be shades of grey, or it could be quite bright if the Sun was at my back. If I looked around my shadow, it gave off a whitish color. But if I looked towards the Sun, it appeared as dark as charcoal. Say the words “Moon Hoax” these days, and almost everyone you know thinks you are talking about the people who don’t believe the Apollo astronauts ever went to the Moon. But back in 1835 there was the original Moon hoax that thousands of people fell for, despite the tall tale being complete fiction. A series of articles were published in the New York Sun newspaper reporting incredible new astronomical observations of the Moon supposedly made by astronomer Sir John Herschel during an observing run at the Cape of Good Hope with his powerful new telescope. Detailed descriptions of winged beings, plants, animals and a sapphire temple increased sales and subscriptions to the fledgling newspaper. The descriptions were allegedly reprinted from the nonexistent Edinburgh Journal of Science, and only several weeks after the articles were published did questions arise about the truth of these tales. The newspaper did not issue a retraction back then, and now, even over 175 years later has not issued a full retraction of it, either. It is said that Herschel was initially amused by the hoax, noting that his own real observations could never be as exciting. But he became annoyed later when he had to answer questions from people who believed the hoax was serious. Shine On Harvest Moon This Week. According to folklore, every full Moon has a special name. There’s the Wolf Moon, the Snow Moon, the Worm Moon, the Sprouting Grass Moon, the Flower Moon, and Strawberry Moon, It continues on … the Thunder Moon, the Sturgeon Moon, the Harvest Moon, the Hunter’s Moon, the Beaver Moon, and the Long Night’s Moon. Each name tells us something about the season or month in which the full Moon appears. This month’s full Moon is the Harvest Moon. The Harvest Moon is the full Moon that falls closest to the autumnal equinox, the beginning of northern autumn. In 2013 the Moon is full on Sept. 19th (the night of Sept. 18-19 in North America) while the equinox follows close behind on Sept. 22nd. The coincidence sets the stage for a nice display of Harvest moonlight. In the days before light bulbs, farmers relied on moonlight to help them harvest their crops. Many crops ripen all at once in late summer and early autumn, so farmers found themselves extremely busy at this time of year. They had to work after sundown. Moonlight became an essential part of farming and, so, the Harvest Moon was born. There’s more to the Harvest Moon, however, than just an old-fashioned name. It really is special. Throughout the year the Moon rises, on average, about 50 minutes later each day. But near the autumnal equinox, this difference shrinks to only 30 minutes. The reason is, at the beginning of autumn the moon’s orbital path makes a narrow angle with the evening horizon. To a non-astronomer, that might sound like celestial trivia. But to sky watchers it makes a huge difference. For several nights in a row around the time of the Harvest Moon, the moon rises at about the same time–sunset. And you know what happens when the moon rises at sunset…. Low-hanging moons are reddened by clouds and dust. Not only that, they are swollen to outlandish size by the Moon illusion, a well-known but still mysterious trick of the eye that makes low-hanging Moons seem much larger than they really are. A huge-looking moon at the horizon isn't actually bigger, closer or even distorted by the atmosphere. It's just a lunar illusion that has defied explanation for millennia. When this month's Harvest Moon arrives, it will perform an optical illusion that has baffled onlookers since Aristotle. As with many moonrises — but especially full moons — it will look bizarrely large when it's near the horizon, then seem to shrink as it ascends. This is the "moon illusion," and it's all in your head. The moon isn't actually changing sizes, and while its distance from Earth does change slightly over time — producing an occasional "Supermoon," which really does appear up to 14 percent larger than usual — that happens too slowly to produce such a dramatic transformation within a single night. Early attempts to explain the moon illusion blamed the atmosphere, assuming the moon's image is magnified by airborne dust near Earth's surface. Dust particles are known to affect the color of sunsets and sunrises, after all, and can even cast an orange hue on full moons. But scientists later realized atmospheric distortion isn't the culprit; if anything, suspended dust should make the moon look slightly smaller when it's low in the sky. If you want proof the moon illusion is purely psychological, just hold a ruler up to the moon when it's near the horizon and again when it's high in the sky. The lower moon may have seemed significantly larger, but a ruler will reveal its diameter hasn't changed. Cameras can also expose the moon's mendacity: This multiple-exposure image, for example, tracks the rocky satellite's consistent size as it rises over Seattle. So what's going on? When we look at the moon, rays of reflected sunlight produce a roughly 0.15 millimeter-wide image on our retinas. "High moons and low moons make the same-sized spot," NASA Science's Tony Phillips writes in an explainer about the moon illusion, "yet the brain insists one is bigger than the other." In October 2018, a 1,600ft-wide asteroid named Bennu will pass Earth, close enough for NASA to land a spacecraft on it. Five years later, the craft will return to Earth. It’ll be carrying rock samples that could tell us exactly how planets are formed. But the mission, dubbed OSIRIS-REx, has another purpose: to lay the groundwork for the development of an asteroid-mining industry. NASA has competition, though. Last year, a group of private investors (among them Google executives Larry Page and Eric Schmidt) formed a company called Planetary Resources, with the intention of mining asteroids for valuable minerals. But before NASA, or anybody else, starts mining on Bennu, the Moon, or any other celestial body, a few questions need to be answered. Does anyone actually have the right to profit from space rocks? And if something should go wrong up there, far from Earth-bound laws, who is responsible? This is where “space lawyers” come in. Space is still the new frontier, and like any frontier it’s a potentially lawless environment. But since the Soviets launched Sputnik in 1957 there’s been an ongoing effort to draft treaties, establish jurisdiction and evolve a body of space law. As the private sector – particularly Richard Branson’s Virgin Galactic– looks toward commercial activity in space, from tourism to exploration, the ensuing legal minefield will be tough to navigate. And if there’s one person who knows what they’re talking about in this rapidly expanding area of law, it’s likely to be Joanne Gabrynowicz, professor of space law at the University of Mississippi, editor-in-chief of the Journal of Space Law (“a journal devoted to space law and the legal problems arising out of human activities in outer space”) and official observer for the International Institute of Space Law to the UN Committee on the Peaceful Uses of Outer Space Legal Subcommittee. On any given week, Gabrynowicz can be found far from home. Last week, it was Virginia, a centre for the growing privatised space sector in the United States; this week it’s Beijing for the 64th International Astronautical Congress. More than 20 years ago, Gabrynowicz left a legal career in Manhattan to teach space law at the University of North Dakota. She’s now the leading expert in a field that’s expanding as the number of countries and private firms looking for new ways to utilise the vast wilderness of space grows. But what of the legal aspects of space mining? Apollo astronauts gathering a few moon rocks (842lb of lunar material, to be exact) is one thing, but space mining is another. “A signatory to the Outer Space Treaty cannot by law appropriate territory and Nasa is a national entity of a nation that is a signatory to the treaty,” explains Gabrynowicz. “So the question becomes, what is that asteroid? Is it a territory or something else, a scientific specimen?” A private firm such as Planetary Resources or Deep Space Industries (which plans to mine space rock for trinkets) is not directly bound by the Outer Space Treaty. But that simply poses more questions. Since property rights in space are untested, what happens if two companies go after the same asteroid? Is it first come, first served? Other questions, though, are much closer to becoming concrete. What to do about the problem of space junk, aka orbital debris? Or even legal disputes between astronauts on board the international space station? A company called ‘Lunacorp’ have politicians from around the world who are property owners, including three former presidents of the United States—Jimmy Carter, Ronald Reagan, and George W. Bush. The Moon would orbit very fast, somewhere between 130 mins and 90 mins, i'll work this figure out later, it's actually a simple problem, but i'm busy! The Moon is well within the Roche limit. at this distance the Moon would break up and form a new ring system. The Earth might also be destroyed. The moon is now known to have water, but could it one day have plants, too? That's a possibility in 2015, if NASA has its way. The space agency recently revealed plans to grow a moon garden, lush with Arabidopsis plants, basil, and turnips. This "greenhouse" experiment would determine whether seedlings can germinate and grow on the moon under lunar sunlight. Researchers with the Lunar Plant Growth Habitat team also plan to test how plants respond to the moon's high radiation levels. If we send plants and they thrive, then we probably can. Thriving plants are needed for life support (food, air, water) for colonists. And plants provide psychological comfort, as the popularity of the greenhouses in Antarctica and on the Space Station show. NASA may launch the essentials for the lunar greenhouse during Google's unmanned Lunar X-Prize mission in 2015. Seedlings are to be housed in specially designed containers -- which NASA is calling for students to create -- that will contain water and air. Once on the moon, the plants will be monitored using cameras and sensors over a period of five to 10 days. Researchers will then compare the plants to control samples of plants on Earth. NASA planetary scientist Chris McKay said the entire moon garden project is expected to cost less than $2 million, Forbes reported.